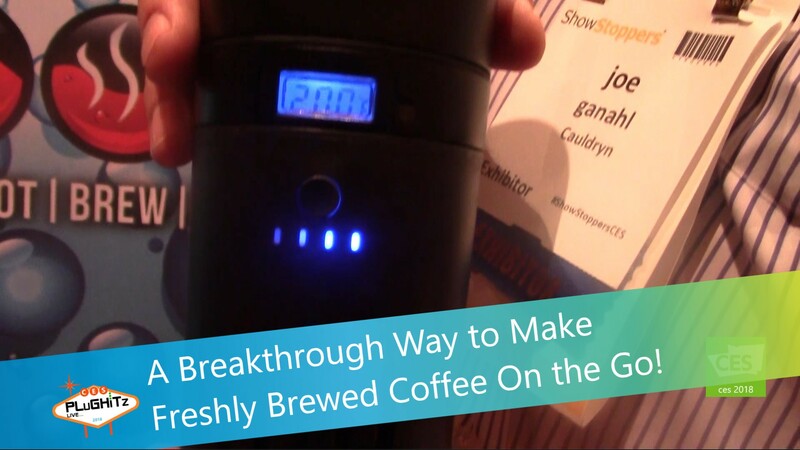 A Breakthrough Way to Make Freshly Brewed Coffee On the Go! If you've ever been on-the-road and wished there was a way to brew your own coffee, then Cauldryn is for you. This seemingly standard insulated mug hides within it superpowers. Using a series of modular attachments, you can boil water, brew coffee and even sterilize water. On the LED screen, you can set your target temperate and see how hot the water has gotten. Once it is to your desired temperature, you can make food, brew coffee or tea or even rehydrate dehydrated food. The portable battery pack can also charge your phone in an emergency. On a full charge you can boil water twice and brew coffee 7-8 times. The Cauldryn is a perfect accessory for camping or hiking. In the control module they have added Bluetooth and Wi-Fi to use with Google Assistant, so when you're at home, you can simply say, "Hey Google, brew some coffee" and Cauldryn will do all of the work for you. The price point for this is $129.00 for the coffee module and $139.00 for the fixed module. For more information go to cauldryn.com.